During her talk on Thursday, September 20th, Dr. Roopika Risam, Assistant Professor of English, Faculty Fellow for Digital Library Initiatives, and Coordinator of the Digital Studies Graduate Certificate Program at Salem State University, posed the question: what are the rights and responsibilities of humanities scholars in the 21st century? While Risam draws an important distinction between digital humanities and activism, she argues that digital humanities methods can be effective tools for calling attention to campus activism in the past and supporting student activists on today’s college campuses. The Torn Apart/Separados project, which she created with seven other scholars in one week in June 2018, served as a reaction to Donald Trump’s immigration policy and the family separation crisis and as a means to think about how to respond or intervene. 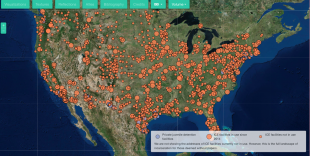 Using data from documents that were previously obtained through the Freedom of Information Act, the project displays a series of data visualizations that represent the landscape of ICE detention in the United States, showing that recent immigration policy impacts many places throughout the country, not just on the Mexico-United States border. The reluctance amongst academics to tackle divisive issues or political work sparks the perplexing question: can one be both an activist and an academic? Risam claims that not tackling political issues in one’s work is a privilege, and Digital Humanities makes activism possible, offering hope for reappropriating knowledge production. For instance, the Torn Apart/Separados project is not an activist project, but it puts data into the hands of people who can make a difference. Instead of suggesting what consumers of this knowledge should do with it, the project recognizes the limitations of its own knowledge and simply aims to publish and display data. According to Risam, we should be excited about what is made possible by Digital Humanities methods yet remain wary about the utopian world they create. Some of the most important work Digital Humanities does, according to Risam, is exert power over the means of producing knowledge. Specifically, Risam teaches her students at Salem State University how to conduct archival research, builds their soft and technical skills, and encourages them to think about the history of activism within their community: Salem State University and the city of Salem, Massachusetts. The students were overwhelmingly drawn to digital histories of activism, exploring records and archives of student organizations from the 60s, 70s and 80s to find out all they could about student activism on their campus. Ultimately, Risam and her students developed Digital Salem, a digital presentation of their research findings, that encourages students to engage with these issues in their lives and with contemporary political issues. The students feel validated when they are participating in activism, Risam stated. So, what are the rights and responsibilities of humanities scholars in the 21st century? According to Risam, campus climate and student interests may require expanded responsibilities that academics previously did not consider their own, and Digital Humanities may be able to assist students in these activist endeavors.